Reproduction spring steel tremolo arm retaining clip for the 1983-84 Fender American Elite Strat with the Freeflyte (Schaller Germany) tremolo bridge that accepts the pop-in style tremolo arm. 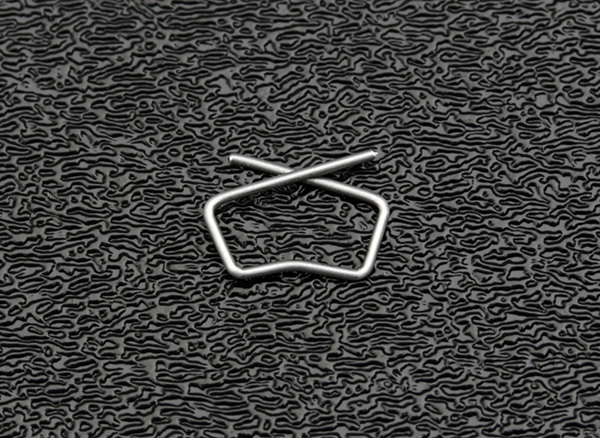 This tremolo arm retaining clip is NOT for the newer American Deluxe, Ultra, Elite or Professional Strat's that also accept the pop-in style of tremolo arm, they use a different style of retaining clip that is offered here. If you are unsure as to which retaining clip your bridge accepts, then write us an email before ordering. Installation: It's not hard by any means to install this little retaining clip, it just simply slides into place. You’ll notice the clip's two ends overlap along the one side so when installing this spring clip on your tremolo arm bushing on your bridge you will want to insert the opposite side of the clip into the small grove in the bushing while tilting the clip up from the overlapping end side so the opposite side will slide into the groove, then simply lower the clip down onto the bushing and use your finger tips to gently pull back slightly on the two ends of the clip to slightly expand it allowing it to slide down onto the bushing. Since there are fine threads on the bushing this clip will want to stay in place by using the threads as a grooves for the clip to hold onto. A review of the photograph to the right will show you exactly how it will look when installed correctly. 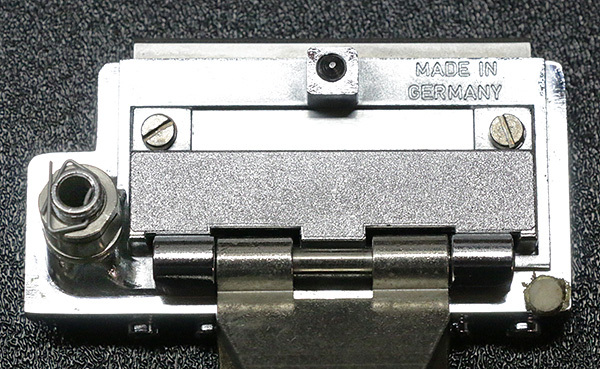 Tremolo arm retaining clip shown installed on the Schaller (made in Germany) Freeflyte tremolo bridge assembly. Bridge shown for reference only, not included in this item purchase. 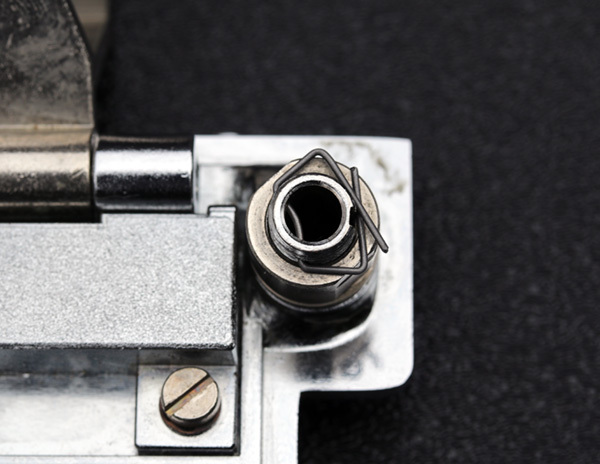 Example showing the top side of the tremolo bridge that we fabricate these tremolo arm retaining clips for. 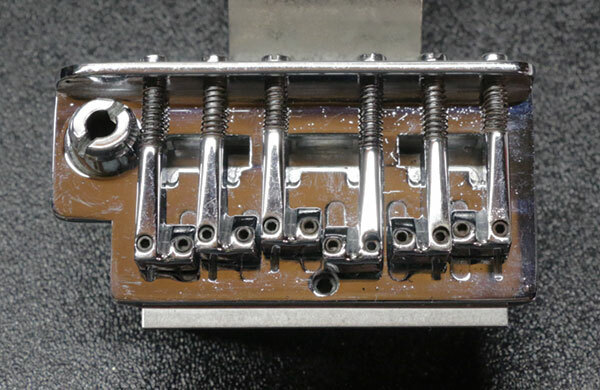 Example showing the back side of the tremolo bridge that we fabricate these tremolo arm retaining clips for.